4ft chestnut pale fence is supplied on 10 yard / 30 feet (9.1 metre) rolls. Each chestnut cleft is secured vertically by two lines if galvanised wire. 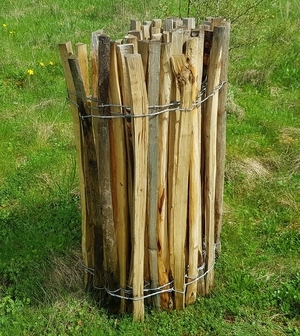 Chestnut paling fencing is a traditional method of fencing - ideal for a fencing in a traditional environment, such as coastal areas, historic house gardens, tourist attractions, gardens, walkways, forest pathways and general boundaries. Chestnut paling is made for chestnut clefts (split timber), that is long lasting. The clefts are secured with high quality thick galvanised horizontal wires. The chestnut clefts have a pointed base for securing into the ground.